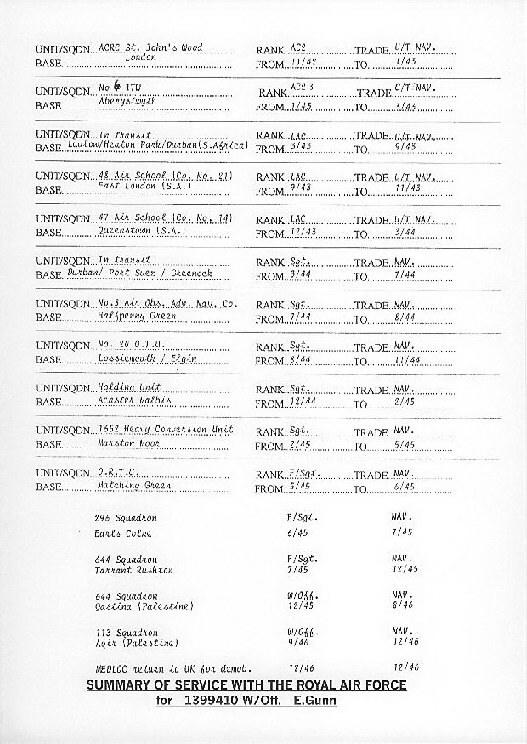 To navigate the Personnel section, all veterans are grouped alphabeticaly by the first letter of their last name. Click on the links listed above to take you to the correct time period. Using the scroll bar on the left, scroll down through the list of names contained within this left border then click on the one you wish to see. Alternatively, you can use the scroll bar on the right and scroll down through all the personnel listed on this page. 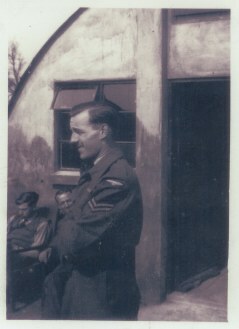 I was a navigator with 113 Squadron at Aqir in Palestine when it was reformed in September1946. This resulted from the depletion of personnel from 644 Squadron at Qastina and 620 Squadron at Aqir due to demobilisation. 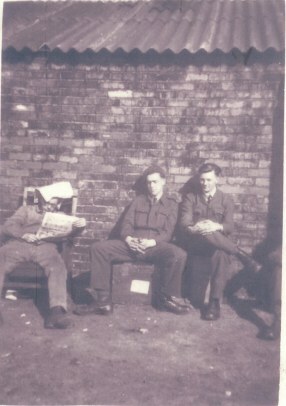 I was originally posted to Qastina when 644 Squadron moved there from Tarrant Rushton in December 1946 with our C.O. Wing Commander Ingle. The C.O. appointed to command 113 at Aqir was Wing Commander Alexander. My service with 113 Squadron was rather brief as although I was posted from Qastina to Aqir at the beginning of September 1946, I left in mid December to return to the UK for 'demob'. During this time the Squadron was employed dropping paratroops at a 'DZ' at Yibna close to the coast and towing Horsa gliders - these flights were exercises for the benefit of the Airborne Forces. We also transported service personnel to the Canal Zone airfields, from where they would go to Port Said, to board ships for their journey home to the UK. Two of my longer flights were to Khartoum for the transfer of personnel. My skipper for two of my three months at Aqir was S/Ldr Thirlwell. Throughout my time in Palestine we carried firearms due to the threat of terrorist attacks. 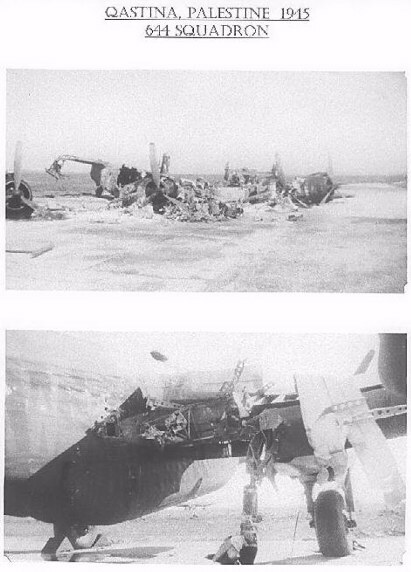 Although the events took place at Qastina during my time with 644 Squadron, I have some photos of the result of terrorist attack when we lost 11 Halifaxes. the main spar area rendering them complete 'write off's'. I joined the squadron in Aquir Palestine in March 1947. 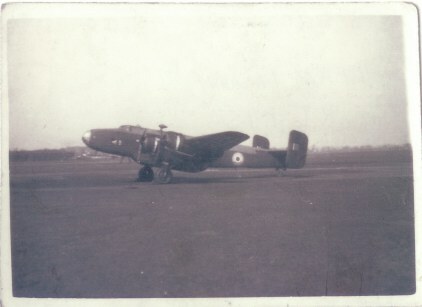 We had Halifax Mk IX, and were employed in ABF duties, dropping paratroops, towing gliders etc. 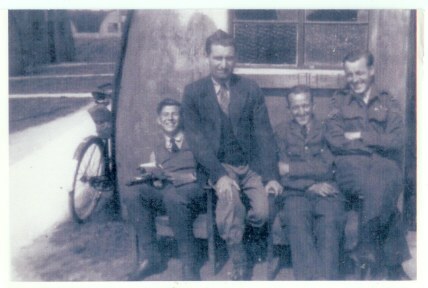 The squadron then moved to Fairford Glos and I was with them untill they disbanded an Sept 1948. I was Flight Engineer and our C.O was S/Ldr Stevenson. 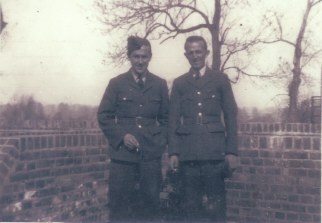 It was June 25th 1946 when I entered the portal gates of Padgate, given a number I'll never forget (2314114), did my square bashing at Compton Bassett, trained as Flight Mechanic (engines) in Credenhill Hereford, posted to 21 PAFU at Moreton in Marsh, Gloucseter (during the hard winter of 47) then to No 5 A.N.S Topcliffe. I then made an exchange posting with someone from Cumberland to 113 Squadron at Fairford. 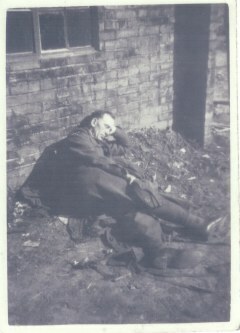 This was sometime in Jan or Feb 1948 and finally demobbed from Fairford in June 1948 ??? a demob No 75 !!! Note in photo above LAC Thomas is wearing Corp Gays Tunic as a lark. As indicated, 113 was one of four squadrons at Fairford in 1948, all four were in dispersals around the airfield with spaces for 6 Halifaxes at each dispersal. 113 was situated at the Eastern side of the airfield practically opposite the Control Tower and the one maintenance hangar. In 113 we had 6 aircraft with the letters H, J, K, L, M, N. The C.O at the time was S/Ldr Stephenson. Our billets were quite a distance from the airfield by the side of the road leading down to Fairford village. 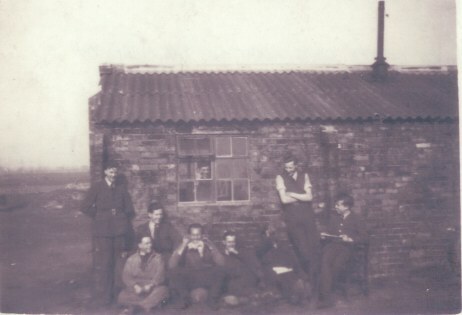 Without exception the billets were Nissan huts as well as the Officers, Sgt's and Airmens mess, the NAFFI and the office building. I well remember waking up in Fairford on my first morning there and doing what I was used to in the centrally heated H Type barrack blocks in Topcliffe and swinging my legs over to where the radiator was only to find myself putting my feet on an icy cold sheet of corrugate iron. Not the best welcome to 113 accomodation !! The first few days in 113 was hell !! Largely due to the fact that the walk to the mess for breakfast must have been nearly half a mile, and the trek around the perimeter track to the dispersal felt like a 2 1/2 to 3 mile hike. Thankfully, I was advised that I was entitled to have a push bike which I gladly signed for at the earliest opportunity. Having had the bike for about three weeks, I went outside the billet one morning to find that some B------d had pinched it. I reported it to the SP's, heard nothing, bought a civy bike from one of the lads who was leaving which I kept for the rest of my time with 113. When my demob loomed, I feared I would have to pay for the lost bike but thankfully, about 3 weeks before my demob, the SP's discovered the frame, and only the frame in one of the dissused buildings on the airfield. What a relief ! Note the Nissan huts in the background and the bicycle. Fred was a huge man. Our hut at the dispersal was not exactly the Ritz. There was just enough room to house us ground bods. Chiefy, who's name escapes me, was quite elderly compared to most of us ground crew. He was one of the old school and what he didn't know about Aircraft Maintenance wasn't worth knowing. The aircraft whose engines were my responsibility was N for Nan RT795 and was regarded as one of the best on the squadron. which I assumed was to train glider pilots. The aircraft would takeoff towing the gliders, do a circuit and while over the airfield the glider pilot would release the tow rope, the aircraft would make another circuit and then drop the rope. Then the glider would land. There was one incident that stands out in my memory. It was a beautifull May evening that 2 or 3 of 113's Halifax's joined with others from the other squadrons as well as 6 or 7 Dakotas from another airfield and we were all assembled on the threshold of the main runway. Some of the Halifax's had gliders attached to them with taut tow ropes, some had a gun and jeep attached slung under the fuselage, others with what looked like equipment boxes, and I seem to recall that the Dakota's were laden with airborne troops. Each aircraft was positioned for early takeoff the next morning. The strange thing is that I can recall all that evenings preparations, but just can not recall what must have been an impressive mass takeoff the next morning. I do recall someone saying that this was all just part of a mass exercise on Salsbury Plain. During my time with 113 there were ample opportunities for Ground Staff to on Navigational trips to such places as Istnes (Masrseilles) Castle Benito (Tripoli) and Fayid (Canal Zone). Sometimes aircraft would carry supplies to these RAF stations attached in the panels under the fuselage. It was customary for the Engine and Airframe Mechanic responsible for the aircraft to be given first chance. One flight that I do recall involved a landing at Istnes when the CO S/Ldr Stephenson was flying N Nan. Accompanying me on this flight was one of the three ex-Polish Air Force bods we had on the Squadron. His English was almost non-existent so the flight was one of the quickest I ever went on. As usual we cleared customs in Lyneham and I noticed the CO and Flight Engineer were both wearing KD's. On landing at Istnes naturally we all waited for the CO to decend the steps under the Halifax fuselage. I could only assume there was someone (as it turned out an Erk) standing watching the CO's lily white legs comming down the steps when I clearly heard a voice saying "Blimey get your knees brown boy." What I couldn't see was the expression on the CO's face, or more interestingly the look on the Erk's face when he realized it was a Squadron Leaders legs he had spotted. One of our aircraft comming back from Fayid in the Canal Zone ran into difficulties and had to divert to RAF Luqa in Malta. Bourke, the Engine Mechanic who was on this trip had to wait a week in Malta while spares were flown out to repair the aircraft, without hardly any money, no change of clothing and no shaving tackle, which really spoiled the trip. Another of these trips was the cause of my having to work on a Saturday which was quite a rare occurence. This particular aircraft when it landed in Lyneham for customs clearance late on a Friday afternoon developed an oil leak in the oil cooler necessitating myself and an MT driver travelling over to Lyneham on a misty Saturday morning to change the cooler. We found the aircraft on a fog bound airfield and with the help of the Engine and Airframe Mechanics who were on the flight managed to change the oil cooler whist lots of Aero Jocks travelled past only feet away from us in the thick mist. How they could see where they were going is beyond me !! Another incident I recall is when my aircraft had been on a night flying exercise. Not being on duty myself I arrived at dispersal next morning to find that the Starboard inner engine caught fire whilst airborne the night before but had landed safely. ( Well done the fire extinguishing system). The Bristol Aeroplane Co reps on the station came over and I was asked to remove the oil filter only to find large lumps of broken piston in it. This of course meant an engine change. I still think the Bristol Hercules engine was as good, if not better than the Rolls Royce Merlin. Corporal Gay - who lent me his tunic so I could claim to be a Corporal. Vic Huggup - from Carlisle. One who had been demobbed but signed back up for a further 5 years. Fred - From Portsmouth. One of the cleverest pianist's I've ever seen in the NAFFI. Freddy would be sitting at the piano, someone would approach him do you know the tune so & so. Fred would say no, how does it go? - hum it for me. In no time he would play it as if he had a copy in front of him. Stapley - a true cockney, Engine mechanic. Knew his job. Taffy Williams - Came from Neath / Port Talbot area. Crabtree - Football mad. Captain of 113 Sqd football team. Lusty - Arranger of the music club, keen on classical music. Did his level best to interest me in C M but to no avail. Chunky - One of the three ex Polish Air Force bods remustered as ground crew with 113. Simmonds - from the Derby area. Engine mech on H-How. 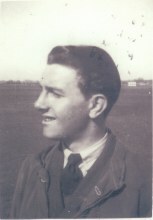 S/Ldr Stevenson, no details known except he was CO of the squadron for a period of time. No further details. Friend of LAC Glen Thomas.